You can easily fill the surrounding containers with tortilla chips and this masterpiece would be considered complete! 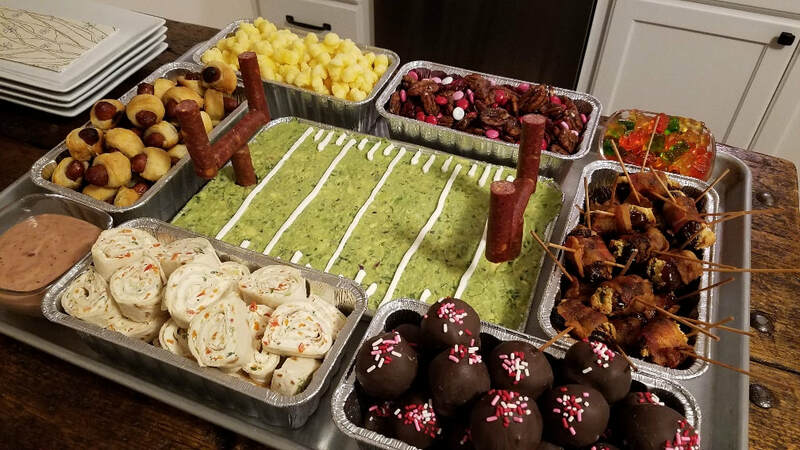 Or… you can place the tortilla in a separate bowl and fill the surrounding containers with my Cocktail Sausages wrapped in Puff Pastry with Cranberry Dijon Dipping Sauce, Blue Cheese Stuffed Dates wrapped in Bacon, Veggie Pinwheels, Key Lime Puppy Chow, Peanut Butter Balls, assorted nuts, M&M’s in the colors of your favorite football teams, Tequila Teddies, (tequila soaked gummy bears) popcorn, or whatever your favorite snacks are! Get creative and have fun with sweet and salty snacks creating your own custom Snackadium!